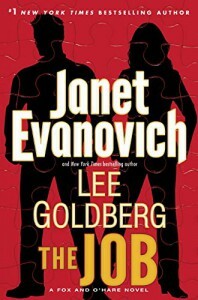 The Job by Janet Evanovich and Lee Goldberg is the book #3 in the Fox and O’Hare series. It is the second book from this series that I've read, and it didn’t disappoint me. I was greatly pleased that I enjoyed reading this book as I expected. As usual, I start my reviews with the book cover analysis. But you'll have to check it out on the full review on my blog. Nick and Kate must catch up Violante, a dangerous drug lord who has been framing Nick for several grand thefts. For this mission they go on an international, wild, and dramatic adventure, that involves expensive chocolate and treasure hunting, and they team up again with memorable characters from the series. Although, it is more enjoyable if you have read the first books in the series, you don’t need to read the first books to get the story. This book can be a stand-alone. You can start the series from here and get the hang of Kate and Nick’s relationship. If you start the series from this book, I’m sure you’ll want to check the first books just for fun. Once again the attraction and sexual tension between the two main characters is enjoyably off the charts. In the previous book, Nick was playfully open about his attraction to Kate, while Kate was struggling to admit she was into Nick. In this book, Nick is as wittingly charming and open as usual, and Kate is not struggling anymore. More about this on the full review on my blog. The Job was a fast paced entertaining read. It had the same combination of witty dialogues, action-packed thrilling scenes, mystery, humor, romance, drama, and likeable characters from the previous books in the series. It was nice to see characters from the past reappear, especially Jake, Kate’s father. There can’t be a Nick and Kate mission without Jake helping them get the job done. His relationship with Kate is endearing, special and unique. Jake is a wonderful character that adds so much to the story. The Fox and O’Hare Series is one of my favorites of this genre. It is definitely a good summer read for men or women. I will definitely read the next installment of this series, which is now on pre-order and comes out September 15th, 2015! You can read an excerpt of book #4 here. p.s. Just a note to editors: there are some French dialogues in a part of the story. For those of us, who speak French it’s no problem, but it would be nice for non-francophone readers to have the translation or the clues as to what the phrases mean.